Its major export partners are Germany, the United States, and Italy. Its main exports are coal, iron ore, gold, and meat. Its major import partners are China, the United States, and Japan. Its major imports include machinery and transport equipment, computers and office machines, and telecommunications equipment. Located in Oceania, Australia is an island nation. It has a 25,760.00 km coastline. In 2007, Australia and Timor-Leste agreed to a 50-year development zone and revenue sharing agreement. Canberra is the capital city of Australia and is located in the state of New South Wales in the southeastern part of the country. The population of Canberra City is slightly under 400,000 people which makes up just 2% of the population of the country. Over 30% of the population of Canberra was born overseas with the most significant numbers of these people coming from the United Kingdom and China. The environment of Canberra is considered an oceanic climate. During January, the warmest month, the average high is approximately 28 degrees Celsius (82 degrees Fahrenheit), and in July, the coldest month, the average temperature is 11 degrees Celsius (52 degrees Fahrenheit). Canberra was selected as the capital city in 1908 and is unique in the fact the city was entirely planned, similar to Washington D.C, and construction of new buildings and substantial development commenced in 1913. 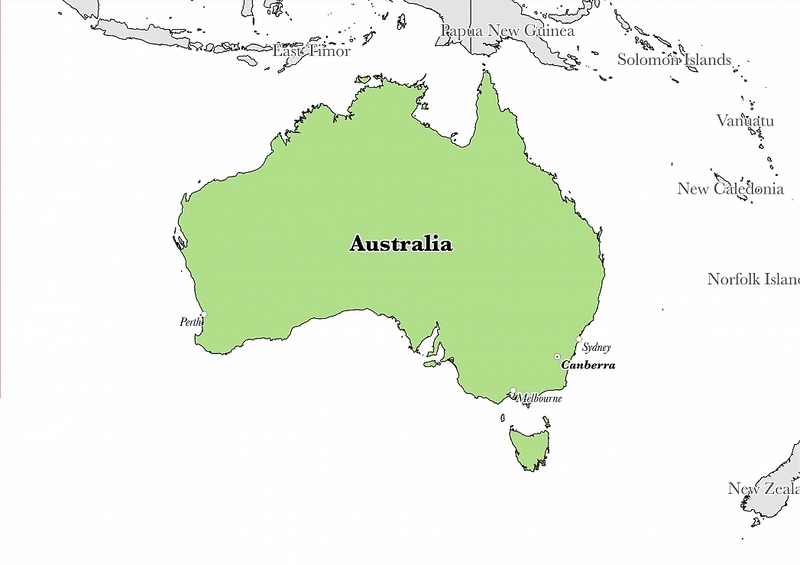 Australia is an Oceanian country covering 7,741,220.00 km2 of which 0.76% is water and 7,682,300.00 km2 is land. This makes it the 6th largest country in the world and slightly smaller than the US contiguous 48 states. Its geographic coordinates are 27 00 S, 133 00 E and Canberra is the capital city. Its ISO code is AU. Australia has a mean elevation of 330 m above sea level. It has an arid to semi-arid climate which ranges from temperate in the south and east and tropical in the north. Its terrain consists of low plateaus with deserts, as well as fertile plains in the southeast. Australia has a population of 22,992,654 making it the 56th largest in the world. English is the most common spoken language. The major ethnic groups reported are English, Australian, Irish, and Scottish. The population mostly identifies with Protestant religions, although many do not identifiy as religious. Australia does not have an official language, but English is widely accepted as the de facto method of communication. Australian English has been heavily influenced by British and American English but has a unique accent and many unique phrases. Minority languages in the nation include Mandarin Chinese, spoken by 2.5% of the population, Italian, spoken by 1.4% of the population, and Arabic and Greek, both spoken by approximately 1.3% of the population. Australian English is the only language used by around 70% of the population but most Australian residents will have a working knowledge of English, and approximately 12% of the aboriginal peoples of Australia speaks an indigenous language while at home. The Australian lexicon seems never-ending, and there are many specific phrases to learn if travelling down-under. Like New Zealand English, the Australian dialect is considered one of the newest branches of the English language. Around 250 indigenous languages are thought to have existed at the time of the first European contact, but fewer than 20 of these languages survive today. Australia is an independent country. it gained independence from the United Kingdom in 1901. Its constitution was last ratified in 1901. The political system of Australia is classified as a federal parliamentary constitutional monarchy. At the national level, elections are held once every three years in Australia. Elections for the Prime Minister can be called at any time, but elections for the Senate are fixed by the Australian Constitution. The most recent national election took place in July of 2016, and the country has had a long history of fair and transparent elections. Malcolm Turnbull is the current and 29th Prime Minister of Australia. Turnbull has held office since September of 2015 and attained a Bachelor of Civil Law degree from Oxford University. The national parliament of Australia is located in the capital city of Canberra and is located at Parliament Hill which is in the centre of the city, surrounded by foreign embassies and other government departments. Factoring in Purchasing Power Parity, Australia's GDP is $1,190,000,000,000.00 (USD) with $48,800.00 (USD) per capita. This makes it the 19th largest economy and its citizens the 28th richest in the world. The currency of Australia is the Dollar (AUD). Its major export partners are Germany, the United States, and Italy. Its main exports are coal, iron ore, gold, and meat. Its major import partners are China, the United States, and Japan. Its major imports include machinery and transport equipment, computers and office machines, and telecommunications equipment. The flag of Australia consists of the Union Jack (British flag) in the top left corner, the Star of Federation in the bottom left corner, and The Southern Cross constellation which takes up the right half of the flag. The current flag is heavily influenced by a flag that was introduced to the country in 1901 through a newspaper contest held by the Melbourne Herald. Only minor changes to the flag designed in 1901 have been made, and the 1901 design is very similar to the present-day flag except for the star on the left-hand side containing six sides instead of seven. 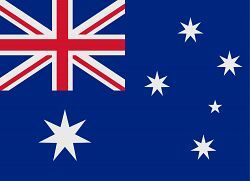 Before 1901, Australia was considered as six separate British colonies, and each state flew a different flag, all featuring the Union Jack. Previous flags include the Eureka flag, the National Colonial flag, the Murray River Flag, and the Australian Federation Flag. There is also an Australian Aboriginal flag which consists of a 50/50 red and black banner divided horizontally centred by a yellow circle.